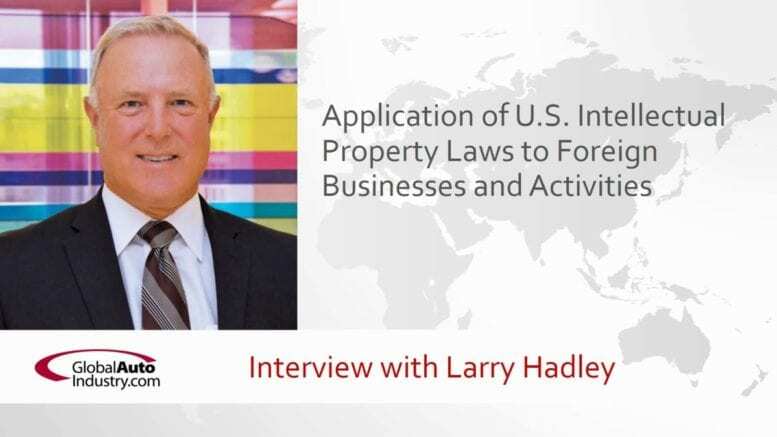 GlobalAutoIndustry.com’s latest Audio Interview, “Application of U.S. Federal Intellectual Property Laws to Foreign Businesses and Activities” features Lawrence M. Hadley. Mr. Hadley is an attorney with over 25 years of experience in high-stakes intellectual property matters, including patents, copyright, trademark and trade secrets. He is currently Partner and the Chair of the Intellectual Property Department at Glaser Weil, a 100-lawyer firm based on Los Angeles. • In what ways can overseas businesses be subject to U.S. Intellectual Property laws? • Where can a foreign business be sued in the United States for allegedly infringing U.S. Intellectual Property laws? • Can you give us some examples where foreign companies have found themselves in U.S. courts for activities that seemed to take place outside the U.S.? • I understand the U.S. Supreme Court last year decided a case called WesternGeco LLC v. ION Geophysical Corp., that addressed liability under U.S. patent law for actions that took place outside the U.S. Can you explain what that case was about? • What advice can you give foreign companies doing business in the U.S. to protect themselves against liability under U.S. intellectual property laws? Glaser Weil Partner and Intellectual Property Department Chair Lawrence “Larry” M. Hadley represents a wide range of technology-industry clients; specializing his practice in patents, copyrights, and trade secrets. Mr. Hadley’s extensive experience includes intellectual property and complex litigation cases involving computer hardware and software, integrated circuit and processor design, wireless communications, medical devices, Internet communications, compression, and storage. His proficiency in technology has led him to appear in courts across the country and before the United States International Trade Commission (USITC). As a former commercial ship and naval officer, and as a licensed pilot; he offers a diverse background, in addition to his 25+ years of legal experience. A highly-regarded thought-leader in intellectual property legal issues, Mr. Hadley acts as a frequent commentator on matters related to technology. Additionally, he previously served as a settlement officer in the Los Angeles Superior Court Voluntary Settlement Program and is ranked in Best Lawyers in America as a leading lawyer in Patent Litigation.